Fusuma no Kakero, lovingly known as "Fusukake" opened up a new shop. Technically it's not a full shop. It's kind of small. Instead of calling it their second shop, they're calling it their 1.8th shop. 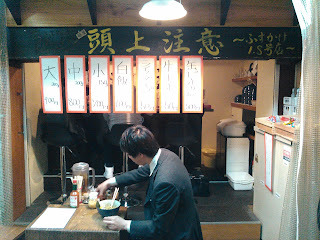 Located where they used to sell Niku Dogs, it seats maybe five people, and offers only maze soba. 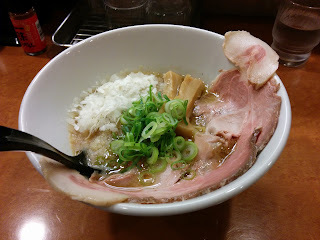 The first appearance of the bowl was of more sweet gelatin pork than of noodles, which I knew right away was a good sign. With things finally mixed together, the taste of the fish powder shone the most through, with light fragrances from the onion and lemon. The noodles were thick and strong, and the chashu, as promised, was plentiful. There were gobs of fat and it had an almost gingery sweetness to it. 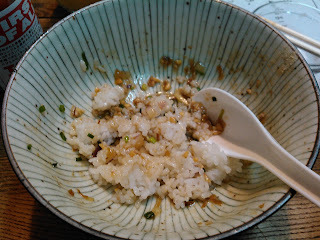 Afterwards the mixed in rice dive was a fresh way to end, and clean up the leftover truffle oil. A long time ago I had been to a Tenchijin, but recently a new one opened up in Den Den Town. 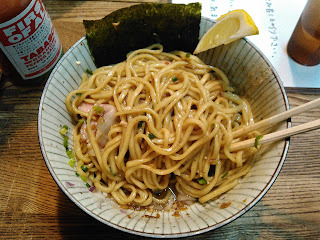 It's easy to get to, so I decided to stop by and try their Tenchijin Ramen. 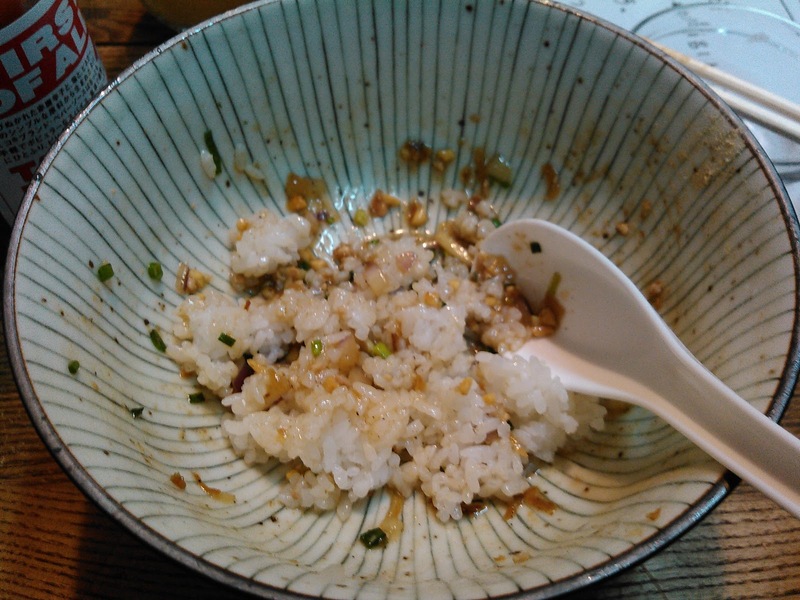 This was a kind of mediocre bowl of oily shoyu; it was quite smooth if a bit thin. The chashu was nice and tender, but stunk up the soup a bit. The egg was probably the best part. It was clean and simple; a good palette cleanser between sips of the soup. Nothing special in terms of ramen, which means it was still an enjoyable meal. 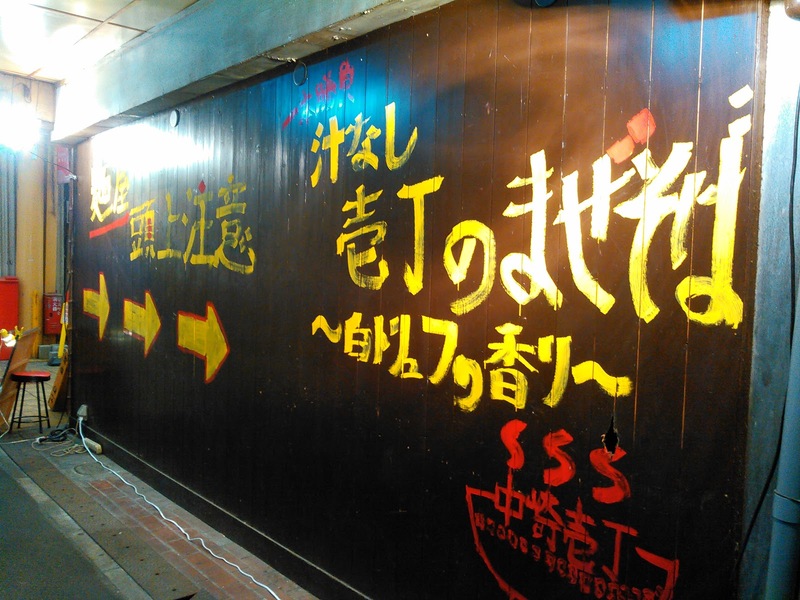 A new shop in Sakaisuji Honmachi opened. It's called Ebi Tori Menzo, or "shrimp and chicken noodle warehouse". It was a tough choice between the shrimp tsukemen and chicken shio, but I was in a tsukemen mood so I went with the former. The soup here was a thick, orange paste, flowing with shrimp, which went well with the square, grainy noodles. But that wasn't the only way to enjoy the broth. There was a baguette for dipping, a chunk of chashu, and a smorgasbord of vegetables. With the potato, tomato, lemon, and greens mixed in, the meal changed into a vegetable potage with shrimp notes. I love when a bowl gives itself new flavors as it goes on, and this was quite a transformation. Yes. I have to try the chicken, after all. 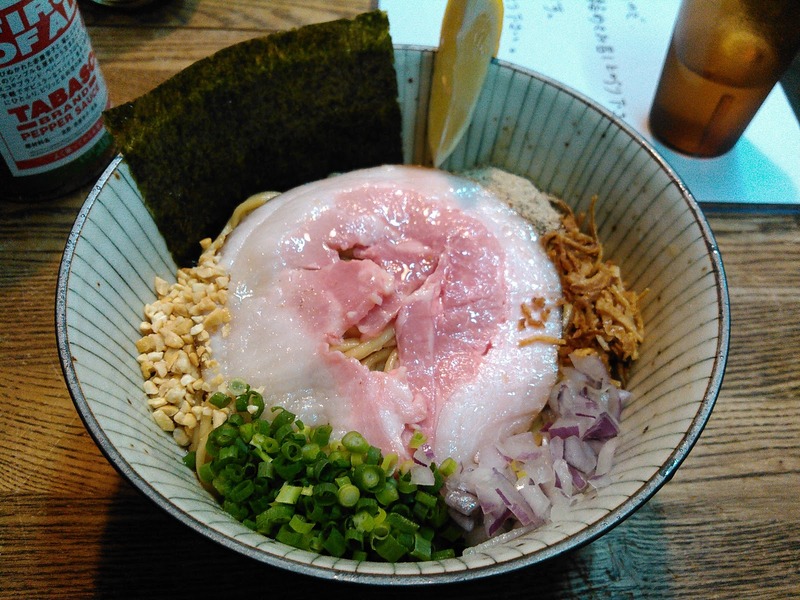 Den Den Town has gradually become more and more of a hub for ramen shops. On this fine night I visited Bakudori King, a thick chicken ramen shop. I got the appropriately named dorobaku or "thick explosion". Bakudori produced an ultra-condensed chicken soup. Soup doesn't really do it justice; it was an overwhelmingly rich, meaty, viscous goop, that was good in a limited quantity, and it was smart of KING to deliver just the right dose. The noodles matched the broth: short, but thick. A single formation of chashu jutted out, also booming with color and flavor. I couldn't eat this every day, but I wouldn't mind another visit. Kotteri fans should check this place out. The curry shop Oretachi no Curry in Den Den Town recently undertook a transformation to become a ramen shop: Koji Labo. While I was tempted to try the curry ramen on their menu, the staff suggested I try their miso ramen instead. The broth base was a salty and oily miso, but that was really where this bowl began. Flakes of mashed potatoes hovered just above sea line, and as those were mixed in the meal became a hearty potage. The pork, similar to other bowls I had recently, glowed red, and with my first bite or two I would have sworn it was roast beef. It turns out it's roast pork, a recent trend of similarly curated meat. To my delight, at the end I was given a bit of curry paste to add. This turned the whole thing into a potato curry stew that barely registered as ramen. What a journey! Worth a stop for adventurers.